29-Dec-2006 -- For almost two years we had been discussing that 19N 52E would be THE confluence point to try to visit. 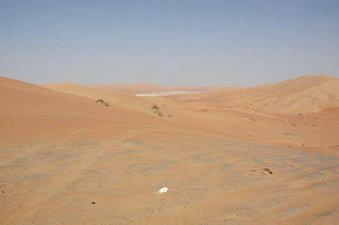 Deep in the Empty Quarter and a long way from any known fuel, it would be a real off-road driving challenge to get there. Add to this the fact that, although classed as a Saudi Arabian confluence point, we were pretty sure that it is in reality the intersection of the borders of Saudi Arabia, Oman, and Yemen. That whole border area is a little sensitive and so we wondered if we would have to negotiate with border patrols from any of those three countries. From a visa perspective, it was much simpler to approach from the Omani side, even though this looked as though we were going to have to cross grain the dune ranges rather than approach using sabkhas. Setting off from Dubayy on 27 December it was some 1600 km to get to the confluence point. Turning off the main Ṣalāla highway at Dawka, we headed towards the tiny outpost of Šisr where we knew there was fuel since we had been there before. This was the last known fuel point before the Confluence and we estimated that we had to be fuel independent for a round trip of some 500 km from this point. When we arrived we were told that they had run out and it would be some days before they had any more. We had 5 vehicles, all of which were carrying additional fuel in jerry cans and so the decision was made to carry on past Fasad, make a camp in the dunes out of sight and leave two vehicles at the camp using some of their extra fuel as additional safety margins for the three cars that would go to the Confluence. The following morning on the 29th we set off early from our camp and made good progress driving across open sabkha and gravel plains, finally getting into the sand dunes near to the border town of Mitān. We had spent a lot of time with maps, Google earth, and NASA LandSat images to try to plot a route across the dunes in advance. We are all experienced desert drivers and this preparation was worth it since we had a relatively straight forward drive through the dunes using our pre-plotted routes across the ranges. Eventually we arrived at 19N 52E in the early afternoon. Many celebrations since, as we thought: this is the exact intersection of the three national boundaries and there is a marker at the spot. Clearly either the locals or the border patrols got bored because the marker had many bullet holes in it! After the celebrations and photographs we had some lunch, but then our concern turned to getting back, as the afternoon was wearing on and we had to reverse the 50 or 60 km of sand driving to get to the plains before it got dark. Although we were equipped to stay in the desert if necessary, we wanted to get back to our base camp if possible. At this time of year the light is gone by 6 p.m.
We just made it to the gravel plains in time and it was going dark as we were re-inflating the tyres of our vehicles and getting out a bottle of champagne that had been reserved for this moment. The champagne had to be quickly hidden, as an Omani patrol from Mitān suddenly arrived. Their English was about as good as our Arabic and so communication was difficult. They were clearly concerned that we may have crossed from Yemen and "requested" that we go with them back to their base. At the base, some more senior members came to check us, one of whom spoke some English. We did not tell them exactly where we had been, only that we had been in the dunes. Once they established that we had the correct documents for ourselves and the cars, they could not have been more friendly. This day was `Arafat Day and they had been fasting but had just taken food as the sun had gone down. We were invited in for food, tea, and soft drinks. They apologized for having delayed but explained that it was their job to "catch" us and asked if the junior soldiers had been rude. We assured them that the soldiers had been polite and all was well. During the course of our conversations they told us that there is petrol at al-Mazyuna some 70 km to the South. We decided that we would check this out the next day rather than returning via Šisr. After about an hour we made our farewells and set off for the long drive across the plains to our camp. This was not the only meeting that we had with the Omani border patrols during our trip, and travelers in this area near the Yemeni border should expect it. However, every encounter we had, once they had established that we had the correct documents, proved to be an enjoyable experience. They were always polite and friendly. The only problem is if you are in a hurry, you should still be polite and accept the offers of tea etc but this will delay you. A special thanks to Muḥammad Ghanem and the team at Mitān. The hospitality meant that it was late when we reached the edge of the dune range in which our camp was hidden. The sand was very soft and the small, steep bowls very difficult to drive through in the dark. Every vehicle got stuck more than once and some were difficult to recover, consequently it took well over two hours to cover the final 700 m to the camp, a small adventure in itself. After a meal at 11 p.m. we slept well that night. According to digitized map data, the borderline to Saudi-Arabia is passing about 6.5 m northwest of the Confluence. The triple boundary point where the borderlines between Saudi-Arabia, Yemen, and Oman meet, is lying about 105 m southwest of the Confluence.